Bullock nailed both field goal attempts in Sunday's loss to the Steelers, as well his only extra point attempt. Analysis: Bullock ends the season 19-for-23 on field goal attempts and 39-for-41 on extra points. The 23 field goal attempts placed him 22nd among all kickers, making him unusable in most fantasy formats. Bullock converted an extra-point attempt and a 51-yard field goal during Sunday's 26-18 loss to Cleveland. 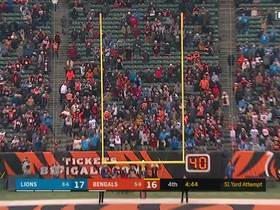 Analysis: Bullock finally put the Bengals on the board early in the fourth quarter with a 51-yard field goal, just his second such conversion of the season and first since Week 5. He's hit all eight of his field-goal attempts over the last four weeks. The season ends next Sunday against a Pittsburgh team against whom he converted three extra points in Week 6. Bullock made all three of his field goals in Sunday's 30-16 win over the Raiders. Analysis: After going through a dry spell, Bullock has converted three field goals in each of his last two games. The veteran kicker is 16-for-20 on the season and has made his last seven kicks. He'll look to continue that streak against the Browns in Week 16. Bullock made all three of his field-goal attempts in Sunday's loss to the Chargers. Analysis: Bullock came through with one of his best performances of the season Sunday, connecting on attempts from 23, 46 and 47 yards out. He has now converted 13 of 17 field-goal attempts on the season -- which leaves him on pace for his lowest production since the 2013 season. Bullock made his only field-goal attempt and sole extra-point try during Sunday's 24-10 loss to the Broncos. Analysis: Bullock didn't see a large workload Week 13, but he managed to convert his lone 35-yard attempt without issue. Cincinnati's offense is one of the least reliable units in the league, so Bullock is not an enticing fantasy option heading into a Week 14 tilt against the Chargers. Bullock missed his lone field-goal attempt and converted two of his three extra-point tries during Sunday's 35-20 loss to the Browns. Analysis: Bullock has missed four of his 13 field-goal attempts on the season, and he was of little help to Cincinnati's offense during Sunday's loss to the Browns. With Andy Dalton (thumb) out for the rest of the season, Bullock's already low fantasy value takes a significant hit. Bullock missed his lone field-goal attempt but converted all three of his extra-point tries during Sunday's 24-21 loss to the Ravens. Analysis: Bullock's lone 52-yard field-goal try came with less than four minutes remaining in the fourth quarter, but he was unable to sail it between the uprights. The veteran has not attempted more than one field goal in five straight games, and Bullock will look to bounce back against the Browns in Week 12. Bullock made both his extra-point attempts during Sunday's 51-14 loss to the Saints. Analysis: Bullock did not attempt a field goal during the Week 10 loss. 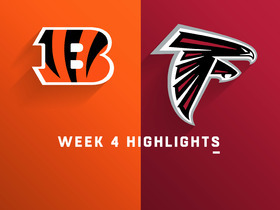 Sunday's game script quickly removed Bullock from the offensive plan, as the Bengals spent almost the entirety of Sunday's game attempting to play catch up. The veteran will look to bounce back against the Ravens in Week 11. 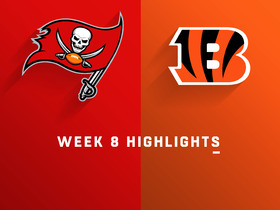 Bullock converted his lone 44-yard field goal attempt and made four of five extra point attempts during Sunday's 37-34 win over the Buccaneers. Analysis: Bullock's lone field goal came as time expired, securing the Week 8 victory for Cincinnati. Bullock missed his first extra point of the season, and is now 9-for-11 on field goal attempts and 26-for-27 on extra point tries. Despite his accuracy, Bullock's relatively low volume makes him an unappealing weekly fantasy start. Bullock made his only field-goal attempt in Sunday night's blowout loss to the Chiefs, a 33-yarder in the third quarter. Analysis: Arguably the Bengals shouldn't have even given him that attempt, given that his field goal made the score 38-10 at the time. Bullock is now 8-for-10 on field goal attempts and perfect on all 22 extra-point chances. Bullock converted all three extra-point tries in Sunday's loss to the Steelers. Analysis: Bullock remains perfect this season on extra-point attempts, as he is now 21-for-21. The Bengals continue to be efficient in the red zone, which actually hurts Bullock's fantasy stock given the lack of field-goal attempts. Bullock converted two field goals from 51 and 20 yards and had a 37-yard attempt blocked in Sunday's win over the Dolphins. Analysis: The Bengals' offense got off to a very slow start in the first half of Sunday's win, but they eventually picked it up and that allowed Bullock to go to work. The Bengals' uncharacteristic first-half performance Sunday should be taken with a grain of salt, leaving Bullock's value in good standing. Bullock made a 36-yard field goal and went 4-for-4 on extra points in Sunday's 37-36 win over the Falcons. Analysis: It was a very productive day in Atlanta for the Bengals' offense, but they constantly found the end zone, which made for a small workload for Bullock. Continued efficiency in the red zone by Andy Dalton and company would result in a serious hit to Bullock's fantasy stock. Bullock converted three extra points but missed a 53-yard field goal in Sunday's loss to the Panthers. Analysis: Bullock saw fewer opportunities in Week 3 with the Bengals offense struggling with turnovers, and he was wide left on the one kick he attempted. Bullock will need the Cincinnati offense to return to the form of the first two weeks in order to remain a reliable fantasy option. The Bengals signed Bullock to a two-year contract extension Tuesday. Bullock made two field goals (28 and 40 yards) and all four extra-point attempts in Thursday's 34-23 win over the Ravens. 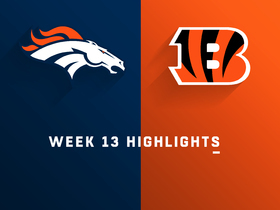 Analysis: The Bengals offense was rolling early with four first-half touchdowns, but Bullock helped put the game out of reach with a pair of fourth-quarter field goals. Bullock has two field goals and four successful extra points in each of Cincinnati's first two games, but he has a tough matchup at Carolina in Week 3. Bullock kicked two field goals (42 and 39 yards) and four extra points in Sunday's victory against the Colts. Analysis: The kicker for what looks to be a much improved Bengals offense, Bullock notched a perfect performance in Week 1. Bullock could prove to be a reliable fantasy option this season, but he faces a tough matchup against Baltimore on Thursday. Bullock beat out Jonathan Brown for the kicker job, Katherine Terrell of ESPN.com reports. Analysis: Bullock was always the favorite after making 18 of his 20 field-goal attempts last season, and his job was confirmed when the Bengals waived Brown on Saturday. While unlikely to warrant fantasy consideration most weeks, Bullock does have a fantastic matchup to start the season, facing a weak Indianapolis defense in a dome game. Bullock is one of two kickers on the Cincinnati roster heading into training camp, with Jonathan Brown set to compete with him. 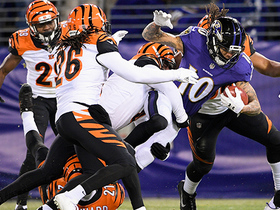 Bullock made his only field-goal attempt and four extra points in the Bengals' Week 17 win over the Ravens. Analysis: Bullock finished the season 18-of-20 on field goal attempts and 31-of-33 extra point attempts, while missing one game due to injury. Meanwhile, 46.2 percent of his kickoffs went for touchbacks. The Bengals let rookie Jake Elliott go, and Elliott ultimately had a good season for the Eagles, but their overall stats were comparable. 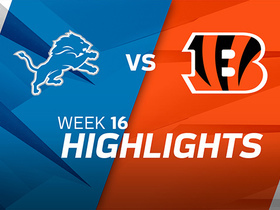 Bullock made field goals from 29, 27, 35 and 51 yards as well as both his extra-point tries in Sunday's 26-17 win over the Lions. Analysis: Bullock's 14 points marked a season high, sending him into Sunday's finale against the Ravens with good momentum. Bullock did not attempt a field goal but made his lone extra-point try in Sunday's 34-7 loss to the Vikings. Analysis: Bullock has scored just one point in back-to-back outings, leaving him with merely 64 points on the season. Bullock did not attempt a field goal but made his lone extra-point try in Sunday's 33-7 loss to the Bears. Analysis: Bullock has gone without a field goal attempt in three of his last five outings, making him a hard player for fantasy owners to trust. Bullock made all three of his field-goal and extra-point tries en route to 12 points in Sunday's 30-16 win over the Browns. Analysis: Bullock's job came under scrutiny after he accounted for just 12 points in his four outings prior to Sunday, but the veteran responded with a flawless showing. Through 10 games, however, the veteran sports just 54 points, making him an underwhelming kicking commodity. Bengals head coach Marvin Lewis said that while Bullock will play Sunday against the Browns, the team isn't necessarily committed to the kicker for the rest of the season, Katherine Terrell of ESPN.com reports. Bullock did not attempt a field goal and only made two of his three extra-point tries in Sunday's 20-17 win over the Broncos. Analysis: Bullock's production has looked identical in back-to-back outings. With only 42 points through nine games, he isn't usually much of a scoring threat, but Sunday's home date with the dismal Browns appears ideal. Bullock (back) is active for Sunday's game against the Titans, Jay Morrison of the Dayton Daily News reports. Analysis: Bullock's injury kept him sidelined for the Week 9 loss to the Jaguars, but the Bengals apparently saw enough from the kicker in his limited practice session Friday to clear him for a return to game action. The team's decision Saturday to waive Marshall Koehn, who handled kicking duties last week, indicates that the Bengals aren't concerned about Bullock's back acting up during the contest. Bullock (back) is listed as questionable for Sunday's game against the Titans, but is expected to handle kicking duties for the contest after Marshall Koehn was waived by the team Saturday, Jim Owczarski of The Cincinnati Enquirer reports. Bullock (back) is listed as questionable for Sunday's game against the Titans after returning to a limited practice Friday, Geoff Hobson of the Bengals' official site reports. Bullock (back) remained sidelined at practice Thursday, Paul Dehner Jr. of The Cincinnati Enquirer reports. Analysis: More on Bullock's status Friday, but if he's is unable to practice this week, Marshall Koehn remains on the Bengals' roster and is thus an option to handle the team's kicking duties Sunday against the Titans. Bullock (back) wasn't present for practice Wednesday, Paul Dehner Jr. of The Cincinnati Enquirer reports. Analysis: Bullock was held out of Sunday's 23-7 loss to the Jaguars, prompting the Bengals to sign Marshall Koehn in advance of the contest to handle kicking duties. Though it's not believed that Bullock's back issue is a long-term concern, he'll probably need to put in some practice time the next two days for the Bengals to feel confident in his availability for their Week 10 matchup with the Titans. Bullock (back) is inactive for Sunday's game against the Jaguars, Paul Dehner Jr. of The Cincinnati Enquirer reports. The Bengals believe that Bullock (back), who is listed as questionable for Sunday's game against the Jaguars, will be able to play in the contest, Ian Rapoport of NFL Network reports. "[Bullock is] on the mend," Bengals head coach Marvin Lewis said after Friday's practice, according to Jay Morrison of the Dayton Daily News. "He showed up with a tight back, and we're dealing with that as we go." 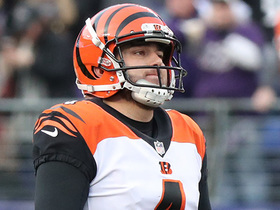 Analysis: Bullock is expected to receive treatment on the back issue throughout the weekend, and so long as the Bengals forgo signing another kicker Friday or Saturday, the veteran's status won't be in much peril as Sunday's 1:00 p.m. EDT kickoff approaches. Bullock has connected on eight of his 10 field-goal attempts and has converted all 14 of his extra-point tries on the season. Bullock (back) is listed as questionable for Sunday's game against the Jaguars, Geoff Hobson of the Bengals' official site reports. 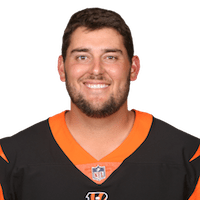 Analysis: Bullock is the only kicker on the Bengals' roster at this time, but if the team makes a move on that front, his status will be worth monitoring as Sunday's 1:00 p.m. EDT kickoff approaches. That said, with 38 points over the course of seven games, Bullock is a marginal fantasy option these days. Bullock (back) returned to practice Thursday, Jim Owczarski of The Cincinnati Enquirer reports. Analysis: Bullock's back injury prevented him from practicing Wednesday, but his involvement in Thursday's session in some capacity indicates that his health isn't a major concern. Unless the Bengals decide to try out kickers or sign one to their practice squad by the weekend, Bullock should be good to go for the Week 9 matchup with the Jaguars. Bullock (back) did not practice Wednesday. Analysis: It remains to be seen whether Bullock's Week 9 availability is in question, but as long as the team doesn't bring in any other kickers, we'll pencil him in to continue kicking for the Bengals on Sunday against the Jaguars. Cleveland Browns defensive lineman Myles Garrett blocks Cincinnati Bengals kicker Randy Bullock's 54-yard field goal attempt. 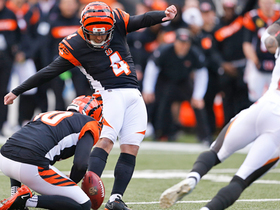 Cincinnati Bengals kicker Randy Bullock sends potentially game-tying kick wide-right. 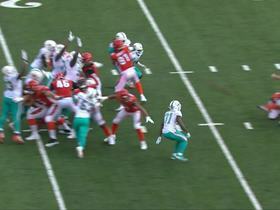 Miami Dolphins special teams come up with a block on kicker Randy Bullock's field goal attempt to keep Bengals scoreless.